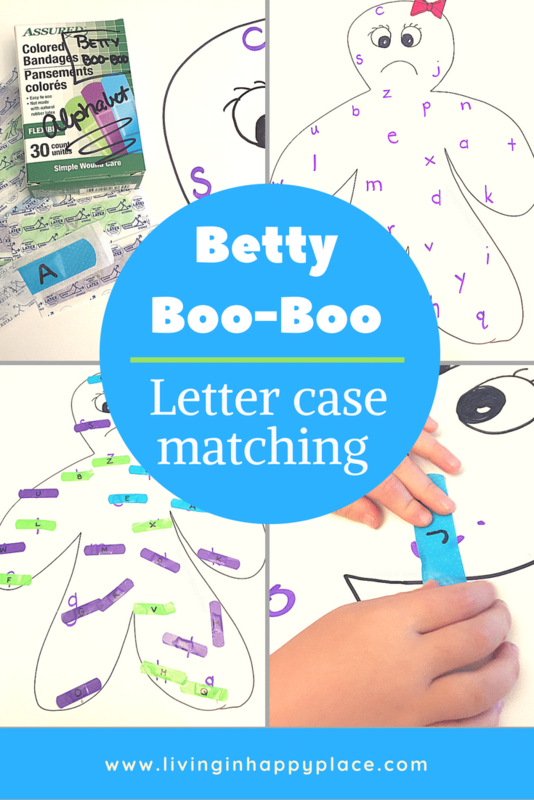 Preview: A fun letter matching activity that builds motor skills and helps preschools match letter case! Betty boo-boo is a fun learning activity whether you are preparing for preschool and working on letter recognition or getting ready for kindergarten and mastering letter case matching. 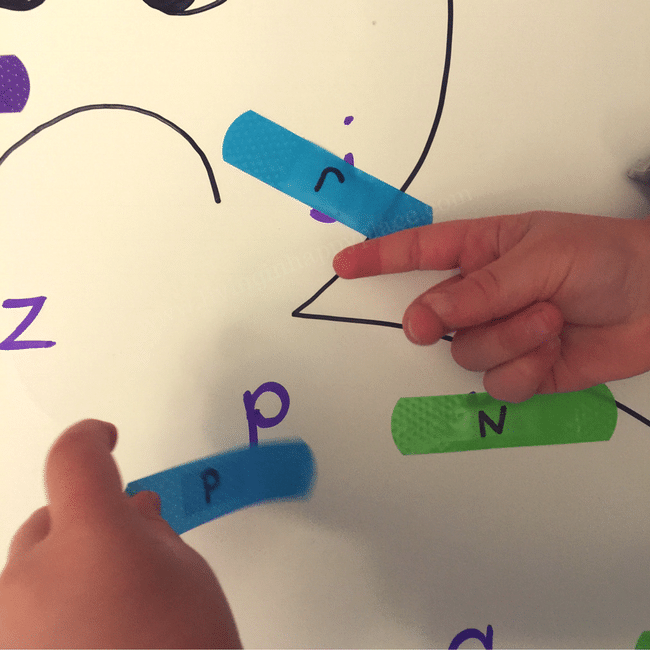 This is an easy, DIY learning game and letter matching activity to help your child match uppercase and lowercase letters while building the fine motor skills they will need to start writing. This post contains affiliate links. LIHP can earn a commission on purchase through links provided (at no additional cost to you). 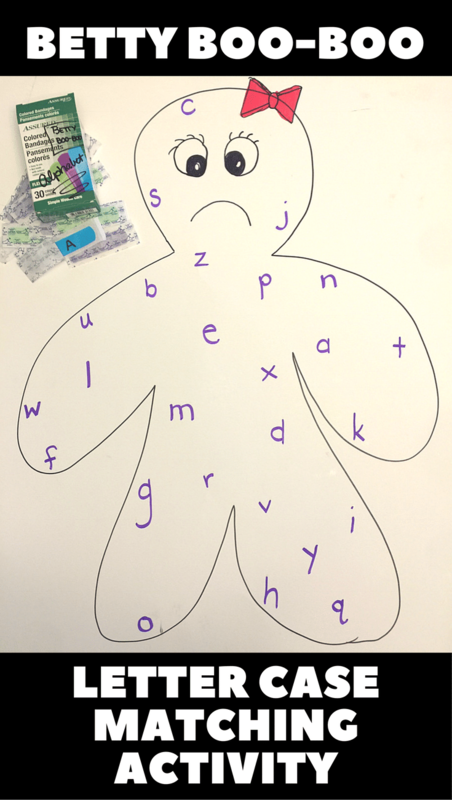 Make letter matching a fun learning activity! Luckily bandages are super cheap (Dollar Tree!) because we go through about a box a week. I realize that it is confusing to kids when we tell them band-aids are for boo-boos so they think that means all boo-boos. I have now started to clarify that bandages are for bleeding boo-boos. It hasn’t helped. They still love band-aids. Since they are obsessed, I figured I would make band-aids part of our learning activities this week. Letter matching is a great activity to work on to prepare for kindergarten. It also helps build fine motor skills (using smaller muscle groups) that are necessary for writing and other similar tasks. This is a fun learning game to review letter case matching. 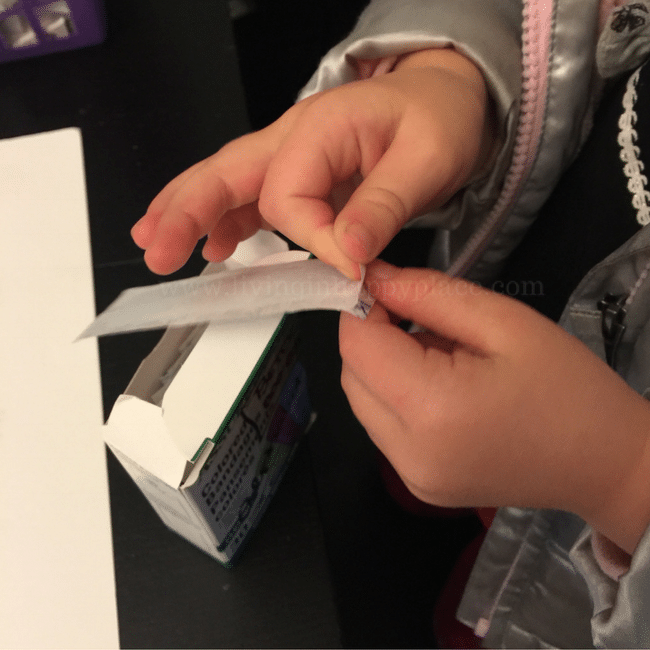 Opening and placing the band-aids is also a great sensory and fine motor building activity. She is sad because she has the Alphabet-Pox. She needs help to cover all of her lower-case boo-boos with upper-case band-aids. Fun, right?! It’s super easy to make. Using one band-aid at a time, carefully peel back the outer wrapping about half way (enough to expose the middle of the band-aid). Using a marker, write an uppercase letter in the center of the band-aid. (I did the alphabet in order to make sure I got all 26 letters). When all 26 band-aids are completed, place all of the re-sealed band-aids back in the box. 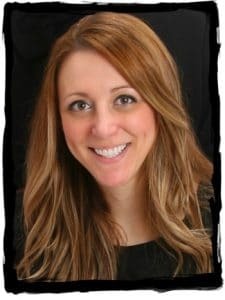 Have your child start by pulling one band-aid at a time. Let them pull open the band-aid and remove all of the wrapping. Keep a ziplock baggie case to dispose of the wrappings. * Try to allow the child to unwrap each band-aid his/herself. This is a great fine motor and sensory activity for them! 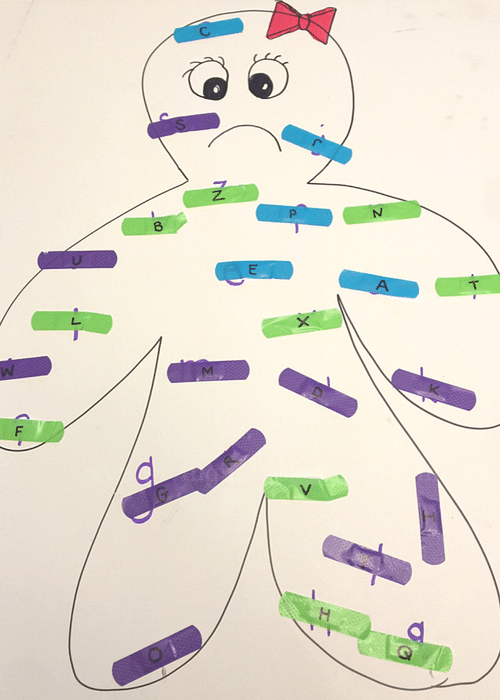 Have the child look at the uppercase letter written on the band-aid and find the matching lower case letter. Use the band-aid to cover the lower case letter. If you are wondering why my daughter is wearing a winter jacket in the house… she is 3. I think that explains it. When there were only a few band-aids left, my daughter said that “Betty Boo-Boo is starting to feel better and now she needs a happy face”. Betty Boo-Boo is all better! Don’t you love activities that are educational, great for building motor skills, and (best of all) a fun bonding experience? And now we have mastered letter matching!